A very busy auction week coming up! On Tuesday, March 26, Koller Auctions in Zurich will sell 274 lots of books, and an additional 63 lots of manuscripts & autographs. Among the former, a 1726 French-Latin edition of Maria Sibylla Merian’s work on the insects of Suriname, bound with a 1730 edition of her book on European insects is expected to lead the way, estimated at about $60,000-90,000. An illuminated Franciscan Book of Hours from around 1460 rates the top estimate among the manuscripts, at $70,000-90,000. Bonhams London will sell Fine Books, Manuscripts, Atlases & Historical Photographs on Wednesday, March 27, in 263 lots. Highlights are expected to include the manuscript marriage contract between Edward III and Philippa of Hainault (£100,000-150,000); an Alan Turing letter to Lionel March about linear and group algebras (£40,000-60,000); and a first impression of Harry Potter and the Philosopher’s Stone, this copy once owned by J.K. Rowling’s literary agent (£40,000-60,000). 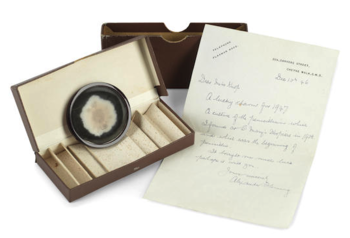 Other lots of note: 175 pages of the manuscript of Wodehouse’s Psmith Journalist (£20,000-30,000) and a presentation sample of penicillin given by Alexander Fleming to Miss Inger Knop (£6,000-8,000; pictured below). Also on Wednesday, Autographed Documents, Manuscripts, Photos, Books & Relics at University Archives, in 276 lots. A January 1801 letter from Thomas Jefferson to his assistant overseer at Monticello rates the top estimate, at $35,000-45,000. A lengthy Davy Crockett letter from May 1830 is estimated at $30,000-35,000, as is a letter from Jefferson Davis accepting his selection as provisional president of the Confederate States. - Printed & Manuscript African-Americana at Swann Galleries, in 405 lots. A collection of correspondence to John Augustine Washington III relating to Mount Vernon and other Washington estates is expected to sell for $20,000-30,000. Benjamin Banneker’s 1796 almanac could fetch $15,000-25,000, while a first edition of Phillis Wheatley’s Poems on Various Subjects (1773) is estimated at $15,000-20,000. - At Chiswick Auctions, 246 lots of Books & Illustrated Art, including Cartoons. - Fine Books, Manuscripts and Works on Paper at Forum Auctions, in 365 lots. A large-paper copy of the 1669 Amsterdam edition of Athanasius Kircher’s Ars Magna Sciendi in an absolutely stunning contemporary presentation binding to Jesuit leader Giovanni Paolo Oliva is estimated at £20,000-30,000. At the same estimate range are a first edition of Stendhal’s La Chartreuse de Parme and a mid-1620s manuscript volume of chess problems by Gioachino Greco. - Kestenbaum & Company sell Fine Judaica: Printed Books, Manuscripts & Maps, in 190 lots. The 1469-72 Rome edition of Nachmanides’ commentary on the Pentateuch, described by Moses Marx as the first printed Hebrew book, is expected to sell for $200,000-250,000. A complete copy of the 1490 Naples edition of Nachmanides’ treatise on the afterlife Sha’ar HaGemul and a late thirteenth-century manuscript prayer book for Passover are each estimated at $80,000-100,000. Many other important manuscripts and early printed books here. Finally, Addison & Sarova will sell 352 lots of Rare Books & Manuscripts in All Fields on Friday, March 30. On Tuesday, March 26, Koller Auctions in Zurich will sell 274 lots of books, and an additional 63 lots of manuscripts & autographs. Among the former, a 1726 French-Latin edition of Maria Sibylla Merian's work on the insects of Suriname, bound with a 1730 edition of her book on European insects is expected to lead the way, estimated at about $60,000-90,000. An illuminated Franciscan Book of Hours from around 1460 rates the top estimate among the manuscripts, at $70,000-90,000. Bonhams London will sell Fine Books, Manuscripts, Atlases & Historical Photographs on Wednesday, March 27, in 263 lots. Highlights are expected to include the manuscript marriage contract between Edward III and Philippa of Hainault (£100,000-150,000); an Alan Turing letter to Lionel March about linear and group algebras (£40,000-60,000); and a first impression of Harry Potter and the Philosopher's Stone, this copy once owned by J.K. Rowling's literary agent (£40,000-60,000). Other lots of note: 175 pages of the manuscript of Wodehouse's Psmith Journalist (£20,000-30,000) and a presentation sample of penicillin given by Alexander Fleming to Miss Inger Knop (£6,000-8,000; pictured below). - Printed & Manuscript African-Americana at Swann Galleries, in 405 lots. A collection of correspondence to John Augustine Washington III relating to Mount Vernon and other Washington estates is expected to sell for $20,000-30,000. Benjamin Banneker's 1796 almanac could fetch $15,000-25,000, while a first edition of Phillis Wheatley's Poems on Various Subjects (1773) is estimated at $15,000-20,000. - Fine Books, Manuscripts and Works on Paper at Forum Auctions, in 365 lots. A large-paper copy of the 1669 Amsterdam edition of Athanasius Kircher's Ars Magna Sciendi in an absolutely stunning contemporary presentation binding to Jesuit leader Giovanni Paolo Oliva is estimated at £20,000-30,000. At the same estimate range are a first edition of Stendhal's La Chartreuse de Parme and a mid-1620s manuscript volume of chess problems by Gioachino Greco. - Kestenbaum & Company sell Fine Judaica: Printed Books, Manuscripts & Maps, in 190 lots. The 1469-72 Rome edition of Nachmanides' commentary on the Pentateuch, described by Moses Marx as the first printed Hebrew book, is expected to sell for $200,000-250,000. A complete copy of the 1490 Naples edition of Nachmanides' treatise on the afterlife Sha'ar HaGemul and a late thirteenth-century manuscript prayer book for Passover are each estimated at $80,000-100,000. Many other important manuscripts and early printed books here.